New classes starting Tuesday Evening and Wednesday Morning this January 8th and 9th – do come and start (or indeed restart) your Tai Chi journey! Tuesday evening class, Form class 7pm, Sword form class 8-8.45pm, Push Hands after. Wednesday morning Form class, 10am, new Push hands class after 11-11.30am. Feel free to come along and try Tai Chi. You need flat shoes (or warm socks) and loose’ish clothing. The classes are informal, fun and the exercise level gentle, though you will get stronger legs! If you want any further information about classes do not hesitate to get in touch or simply turn up! I also specialise in one to one private tuition. I can also teach groups with individual needs, such as seated work in Care Homes or exam stress busting sessions in schools or any bespoke sessions. St Mary’s Hall in Launceston, Cornwall. St Mary’s Hall in Launceston, Cornwall. Suitable for all beginners, ages, abilities – gentle Tai Chi exercises, QiGiong (eight silk brocades) and learning the concise training form and the Chen Man Ching short form. 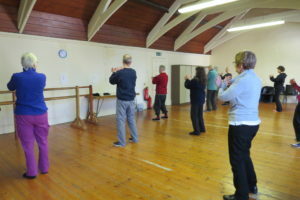 Again suitable for beginners or more advanced players- we will do full BTCCA (British Tai Chi Chuan Association) exercises, QiGong; Chen Man Ching and Dr Chi Chiang variation short form. I also teach the Long Form in the Advanced Class, Sword Form and we have a Push Hands practice every week as well as other partner work. Roughly, I charge £45 for an hour’s one to one and £60 for one to two etc Feel free to get in touch and we can discuss your individual needs.